The Bison women's volleyball team celebrate after upsetting the UBC Okanagan Heat 3-1 on Feb. 17 at the Investors Group Athletic Centre in Winnipeg. 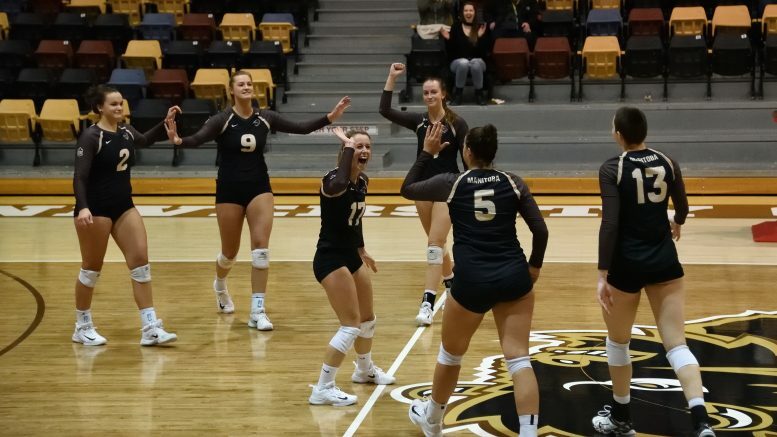 The University of Manitoba Bison volleyball programs secured playoff berths Saturday against the University of British Columbia Okanagan Heat. The men’s team earned a sweep over the Heat without losing a single set to end the regular season on a four-game win streak. “The way we played the last two weeks of the season is really gratifying to see us play some of our best volleyball this time of the year,” said Bison head coach Garth Pischke after Saturday’s 3-0 win over UBC Okanagan. The Bison men’s team finished the season with an 11-13 record, placing them seventh in the Canada West. Pischke’s squad did this by starting four first year players – and first year setter Jack Mandryk has played exceptionally well for Manitoba down the stretch. “We called upon him when we didn’t expect to and he came through for us and really showed a little bit of leadership and some great setting skills for a first year kid,” Pischke said. It was a bittersweet weekend for a pair of Bisons, as fifth year players Scott Vercaigne and Adam DeJonckheere were playing in their last home game in brown and gold colours. Vercaigne saved his best night for last, finishing with a team-best 19 kills. DeJonckheere etched his name in the record books over the weekend and took sole possession of second place all-time in Canada West career conference kills with 1,394. On the women’s side, the Bisons had to win a set against the number one ranked Heat on Saturday to secure a playoff berth. It appeared to be a daunting task, as Manitoba fell 3-1 the night prior. They did more than just that, as the giant was slain 3-1. The Bisons lost the first set handily, but they stormed back to win three straight. “It was a pretty poor start,” said Bison head coach Ken Bentley after Saturday’s win. The win marks a return to the playoffs for the Bisons, as they finished the year seventh in the Canada West with a record of 12-12. A key aspect of Manitoba’s success this season was the return of former national champions Brittany Habing and Emily Erickson. The pair came back this season and officially bid their final farewell to Investors Group Athletic Centre. Habing had a remarkable match on Saturday, the setter finished with 43 assists, 13 digs, five kills, and four blocks. “It’s bittersweet to play the last game on this court. Obviously these years have meant a lot to me,” she said. With Manitoba’s seventh place finish, the Bisons will see the Heat again next weekend in the Canada West quarter finals, this time in Kelowna, B.C. “They’re such a fun team to play because they’re very physical, they’re very athletic,” Habing said. The Bison men’s team will head out to Vancouver on Feb. 23-25 for a three-game series in the Canada West quarter finals against the UBC Thunderbirds, while the women’s team will open their playoff run a few hours east in Kelowna, B.C. for a rematch against the UBC Okanagan Heat that same weekend.